How adorable is this sweet knitting kitty? 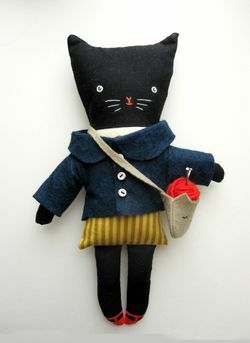 I love her accessories - from her itty bitty red mary janes, to her cat-head purse filled with the tiniest ball of yarn and knitting needles! Unfortunately, this handmade creation is a limited edition of one, and was snapped up quickly on Etsy. I have to say, from Lieschen Mueller to A Black Apple, cat fashion dolls are having a serious moment! Oh my!! I want her! Totally and completely stinkin' cute. 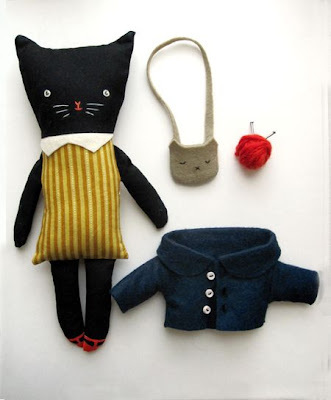 I have a cat doll handmade in Tennessee who resembles this cat doll, but sans clothes and accessories. I'm gloatin'.